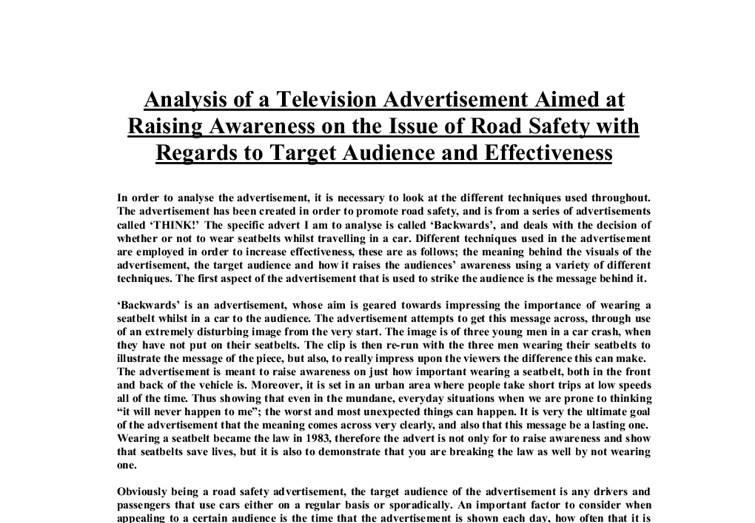 Analysis of a Television Advertisement Aimed at Raising Awareness on the Issue of Road Safety with Regards to Target Audience and Effectiveness In order to analyse the advertisement, it is necessary to look at the different techniques used throughout. 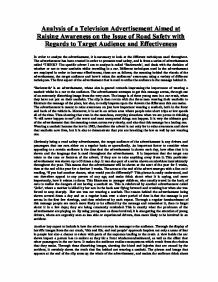 The advertisement has been created in order to promote road safety, and is from a series of advertisements called 'THINK!' The specific advert I am to analyse is called 'Backwards', and deals with the decision of whether or not to wear seatbelts whilst travelling in a car. Different techniques used in the advertisement are employed in order to increase effectiveness, these are as follows; the meaning behind the visuals of the advertisement, the target audience and how it raises the audiences' awareness using a variety of different techniques. The first aspect of the advertisement that is used to strike the audience is the message behind it. 'Backwards' is an advertisement, whose aim is geared towards impressing the importance of wearing a seatbelt whilst in a car to the audience. ...read more. This particular advertisement was shown up to 25 times a day. It was also part of a series shown on television intermittently throughout the year. This means that the advertisement will be shown at the start of the year for 3 weeks, then at the end of the year for a further 3 weeks. The scene at the end of the advert emerges with a line on it reading, 'If you had another chance, what would you do differently?' This phrase is easily understood, and can therefore appeal to any person of any age, and make think about what it is saying, and more importantly, how it relates to them. This illustrates to younger children, who usually travel in the back of cars to realise the dangers of not having a seatbelt on. This is reinforced by another advertisement called 'Julie', where a mother is killed by her son in the back seat flying forward and crushing her when she was forced to stop sharply. Her son was not wearing a seatbelt. ...read more. The advert uses the language in such a way to prevent the audience from forgetting the advertisement, as well of the image of the pizza that was held by one of the rear passengers being splattered all over the front window a symbol of what has happened to those in the car. It is also used to resemble what happened at the start of the advertisement, helping people to recall the whole of the advertisement. Although the advertisement does use shocking images to make its point, they are used in a very serious and respectful way. The advert is very effective in the ways it targets its audience and gets the message across to them. One way that this advert gets it message across is through the shocking images that it uses. It takes time to change people's attitudes, but that is exactly what this campaign does, makes people think about road safety. The most important aspect of the advert is the thought it evokes. It doesn't force, or tell people what to do; it shows the consequences of such actions. Illustrating the advert's effectiveness, in fulfilling its purpose of raising awareness, and in leaving a lasting message. ...read more. This is done to make the lady look more realistic as she appears to the reader to be just in front of them. This creates more attraction for the viewer when they look at the advert. In advertisement 2 the camera has been positioned above and slightly to the bottom of the playing cards. The writing is persuasive because of the use of adjectives, and also it presents detailed information about the Vectra. The Vectra is in a more prominent position then the VX220 in the picture. The aim of the advert is to increase the amount of Vectra's sold. The knowledge, understanding and skills required to achieve this are shown below, and will act as evidence to meet the assessment objective. * Produce one example of direct advertising, one example of indirect advertising, one example of a promotion o Produce: e.g. ideas are used in the second poster; it is very simple and is based on the intertextuality of the Oliver twist film. As GM's famous slogans says: "It's not more than you need, just more than you're used to" Americans, however seems to enjoy green space and the beautiful undisturbed scenery. When it came to using the reserve oil supply in Alaska there was great turmoil over this decision. Therefore, due to the vague of the text, the ad may be connoting a broad, pseudo feminist lifestyle approach. By using the concept of "holding to your choices" the text may be hinting at broader issues than just the alcohol seen in this ad.